Shoelaces are common products that can be found easily at stores. However, packaging can work wonders by transforming an ordinary item into a unique and wanted product. Let’s take a look at Barbiturik and Stolen Riches packaging using test tubes for branded shoelaces. Why We Love This Branded Shoelaces Packaging? Customer Appeal: Barbiturik packaged their branded shoelaces creatively using plastic test tube holders. Portraying a creative and fun vibe, Barbiturik’s branded shoelaces appeal to their target audience, skateboarders. Brand Visibility: The unique packaging concept makes the product stand out from the ordinary shoelaces that are regularly found in the market. With the brand logo printed on the product, Barbiturik enjoys added brand exposure. Practical Appeal: Users can remove their branded shoelaces and store them individually in the test tube holder. It’s a simple and useful packaging that keeps shoelaces untangled. 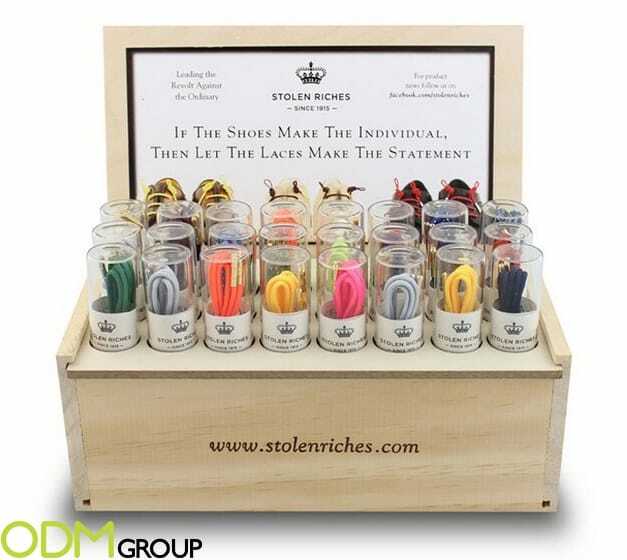 How Can You Attract Attention And Boost Sales With Branded Shoelaces Packaging? Firstly, choose your material. Choose from a variety of packaging materials, such as glass to make your product appears high end and of good quality. Secondly, custom your design. Decal stickers or laser printed images can be customized on the transparent test tube. You can keep a minimalist design just by printing your brand name and logo. Thirdly, get creative with packaging ideas. For instance, you can package it as a gift set as seen from image above. The case contains a variety of colors for different styles. This will encourage customers to buy more, thus increasing the sales of your shoelaces. It’s fun to have a change of colors to define one’s personality or fashion statement. Interested in unique packaging for your custom promotional merchandise? Feel free to contact us today! Our in-house design team, Mindsparkz, will be glad to assist you in brainstorming creative concepts. Below are some blog post on creative packaging ideas that might inspire you for your next campaign! For the spirit industry, check out the blog below for some innovative packaging ideas! Additionally, consider intriguing packaging designs to revive the DVD industry! Besides, you can also attract customers at the point of sale with innovative packaging! Lastly, understand the importance of custom packaging for your business!